In the case of Pieces of Why, there were three primary sources of inspiration, all of which had something in common: gun related violence. It might seem strange to think that the driving forces behind a book for children – especially young children – would be so harsh. How and why does one attempt to translate the toughest realities of our world to children? The answer to “how”, for me, is to offer as much hope as hardship, and as much beauty as brutal honesty. What else can we offer our children in the face of violence, other than the same comforts we offer ourselves? The hope that in the end, goodness will outweigh injustice. The desire to change our world for the better, and the belief that change is possible. One of the most powerful functions of fiction is to allow us to imagine the futures we want and those that we don’t want, and to empower our society to make decisions accordingly. To deny the existence of gun related violence to kids who live with the aftermath does nothing, but to teach them that they can overcome this legacy and perhaps create a different future offers hope that another path is possible. 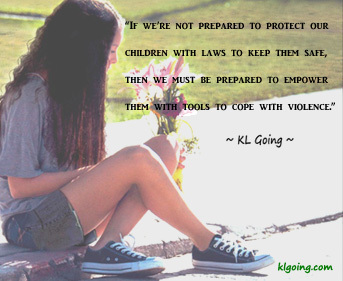 To those who might question the need for children’s books that deal with gun related violence, I would say this: If we’re not prepared to protect our children with laws to keep them safe, then we must be prepared to empower them with tools to cope with violence. This is my belief as well, and I want young readers to know that what’s happening in America right now in terms of gun related violence isn’t normal. It isn’t right. And it isn’t inevitable. This is a hard subject to acknowledge. The temptation to remain silent in the name of shielding our kids is a strong one. But in a world where almost every public place has a big screen television, and children are plugged into the media at younger and younger ages, the choice to remain silent is not always ours. And with nearly 12,000 Americans killed with guns every year, a rate 20 times higher than other developed countries (Everytown for Gun Safety), the circle of connection is narrowing. Gun related violence is wide spread, often random, and pervasive. We KNOW this. We see the news reports. We read the statistics. But we often fail to acknowledge that the ripple effects spread far wider than we’d like. It isn’t just the people in the direct line of fire who are affected. It’s every one of us. And it isn’t enough to hold our breath and thank God that it wasn’t our child, our loved one, our family member (at least not this time). We must acknowledge that every instance of violence does harm to us all – mental, spiritual, and emotional harm. We must create safe spaces for kids to talk about their fears, to discuss what’s happening in the world around them, and we must provide models of people who may not have all the answers but are doing their utmost to make the world a safer place for the next generation. My wish is this: may these people be, not just fictional characters, but every single person in a child’s life. Every parent, teacher, law maker, neighbor, friend … all of us working as hard as we know how until we’ve changed our world. Their world. May these people be you and me.